a piece of bamboo cane. This basket has a cover formed of two pieces. It can be employed for many things, and is formed entirely of crochet-work with brown silk over straw. 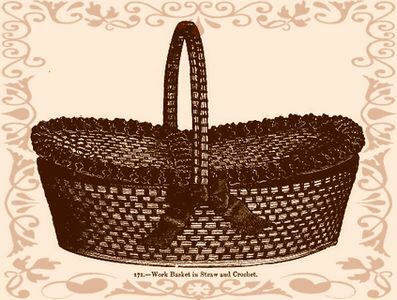 A ruche trimmed with beads and bows of brown silk ribbon form the trimming of the basket. The straws over which you crochet must be damp, so as not to be stiff. They should be of unequal length, and when you join the two ends of two straws together, try to hide the beginning with the other straws. Begin the basket in the centre of the bottom part with 46 stitches; then work 9 rounds on either side of this first row, working alternately 1 double stitch, 1 or 2 chain stitches, the double stitch in the chain stitch of the preceding round, the last round over wire. It is necessary to increase regularly in all the rounds to keep the work flat. When you have finished the bottom begin the border of the basket, which is worked of the same piece with it, and consists of 11 rounds. It is worked in the same way as the bottom, the first 2 rounds without increasing the number of stitches, but in the following 9 rounds increase 2 double stitches at both ends, in order that the edge may be a little wider in the upper part. In the last round add a piece of wire to the straws. The cover of the basket is formed of two pieces. Begin in the middle with 28 stitches; crochet each half in rows forming a half circle, working backwards and forwards; at the beginning of each row turn the straws, and take care that the rows which are finished form a straight line. Each half of the cover requires 9 rows; the last one is worked over wire. The two halves are united at the straight sides by a brown silk ribbon 1-1/4 inch wide, which is sewed on underneath, and which forms a sort of hinge; sew on also a piece of wire covered with brown silk, so as to make the hinge stronger. Form the handle with a piece of bamboo cane 23 inches long, and covered with straws; work over it in long stitches of brown silk, and let it go down to the bottom of the basket; then sew the cover on the handle with the brown ribbon, which forms the two parts. Trim the basket with a ruche of double box pleats, ornamented with glass beads and with bows of brown silk ribbon.